2/2009: The Beach Theatre Foundation’s lease was extended through March 2009. They continue to search for a developer that will restore and maintain the complex and retain the complete theater. 10/22/2009: On October 14, 2009, the Cape May Planning Board voted unanimously to pass a resolution that deems the Beach Theater a key, contributing a historic resource to Cape May. This is part of an effort aspiring to the passage of a similar resolution by Cape May City Council. Owner Frank Investments has issued approval for demolition by the City’s Historic Preservation Commission during the summer of 2009. Frank Investments plans to demolish the theatre while retaining the lobby and retail storefront portions of the complex for incorporation in a potential future hotel or condo development. Frank Investments continues to dispute the theater’s historic significance. 1/2010: On January 20, 2010, the Cape May City Historic Preservation Commission heard a case for partial demolition presented by Frank Investments, owners of the Beach Theatre complex. The commission voted 5-2 to decline the petition. This was the second such petition to the HPC. An initial demolition permit was granted in 2007, but not executed by the owners before it expired. 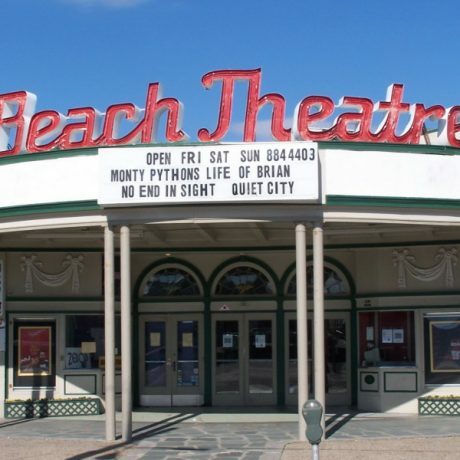 4/2010: The City of Cape May has demanded immediate repayment of a loan given to the Beach Theatre Foundation in 2007 for maintenance and operation of the theatre under the terms of a lease by the theatre’s owners. This lease was not extended past March 31, 2009, leaving the BTF without what would have been its primary source of income during summer, 2009. The BTF is disputing the City’s rights to accelerate the note. Additionally, the Beach Theatre Foundation has sued the City of Cape May, indicating that it issued the initial demolition permit improperly. 10/2010: The Beach Theatre’s owners have won a hearing with Cape May’s Zoning Board of Adjustment. They are appealing the Cape May HPC’s January 2010 denial of a demolition permit for the Beach Theatre property. Hearings began in October, and are expected to continue for several months. 3/2011: Zoning Board of Adjustment hearings on the Beach Theatre continue. Frank Investments has filed suit against the City of Cape May, contending that the 2007 demolition permit, which the city maintains that Frank Investments failed to act on before expiration, should have been automatically extended by a 2008 state Permit Extention Act. 5/2011: In what the Beach Theatre Foundation is calling a “secretive” move, Cape May City Council voted on 5/3 to allow demolition of the Beach Theatre, settling the March 2011 lawsuit (see above). The vote is being called secretive as it occurred at a City Council meeting and was listed on the agenda simply as “approving a resolution involving litigation.” Zoning Board of Adjustment hearings has not yet settled the issue of the theatre’s historic status. Another ZBA hearing is scheduled for May 26, but it is unclear at this time as to whether City Council’s vote renders future hearings moot. The Beach Theatre Foundation and local advocates have vowed to fight the council decision. 7/2011: The NJ Superior Court has dismissed the Beach Theatre Foundation’s suit charging that the city improperly issued a demolition permit, saying that the Foundation has no legal standing. 9/29/11: Hours after the City of Cape May issued yet another demolition permit for the Beach Theatre, demolition has begun. Built in 1950 at a prominent location on Beach Avenue in historic Cape May, the Beach Theatre may become the latest victim in the epidemic of “tear downs” at the Jersey shore. Designed by well-known theater architect William Lee for William Hunt, the Beach Theatre was considered quite innovative when it was built, because of its’ “storefront” design with accompanying shops. When it opened, reports in the Cape May Star and Wave described the uniqueness of the theater and the attention that Mr. Lee paid to design a modern structure that would fit in with Cape May’s historic architectural fabric. While Mr. Lee designed other theaters for theater owner William Hunt, the Beach Theatre was the first, and only remaining, an example of a storefront theater on the Jersey shore. The theater has operated continuously since its opening, initially as a year-round movie theater and, in recent years, during summer months only. Anyone who has vacationed in Cape May has greatly appreciated the existence of the Beach Theatre, the only theater in town, on those occasional rainy summer days. The Beach Theatre’s prominent location is, of course, the very reason for its threat – it is located on prime beachfront property that, if developed at a higher intensity use, could yield large financial benefits for the owners. The theater is currently owned by Frank Investments, whose application for demolition and redevelopment of the Beach Theatre “complex” was approved by the Cape May Historic Preservation Commission in the fall of 2007. Under the approved proposal, the theater “box”, where the seating is located, would be demolished and replaced with a parking garage to serve the condos that will be built on top of the current shops, adding two additional stories to the currently one-story shop structure. In addition to demolishing the theater box, the new exterior and the existing storefront section would be of a Victorian design. While the architecture in Cape May is predominantly Victorian, such changes to the Beach Theatre and shops would eliminate the buildings’ architectural integrity and significance. expires in the fall of 2008. The BTF is currently looking for a developer who will buy the Beach Theatre and accompanying retail stores and restore the complex. The existing downturn in the real estate market only makes the challenges of finding such a developer more difficult.